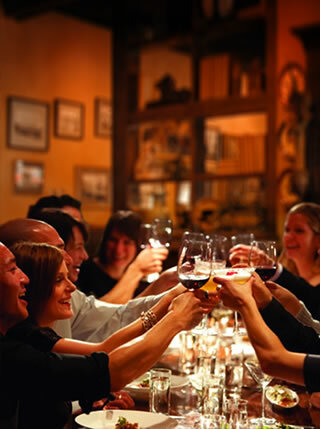 —A credit card and signed contract is required to reserve your group dining event. —Our group dining manager will provide you with a contract once availability is confirmed. —Please provide a way for your guests to RSVP so that you can give our managers an accurate group size. This will allow us to plan and staff accordingly. —Please remind your guests to arrive on time so that the allotted time will be sufficient for your dining enjoyment. Host your graduation celebration, birthday party, corporate function, or family gathering at The Chop House! Most of our locations offer group and event dining for parties up to 50. In order to reserve a room privately, there will be a minimum size or spend required for the party on certain days. We'll work with you to design a custom menu that fits your budget with the option of appetizers, wine pairings and desserts. Fill out an online form so we can gather important details about your event. Select your location from the list below. The Chop House® steakhouse serves premium steaks and fresh, U.S.D.C. inspected seafood. If your location is not listed below, please call to reserve. The Chop House steakhouse restaurants — serving premium steaks, chops and fresh seafood since 1992. You may also be interested in the following websites: Connors Steak & Seafood | Connor Concepts, Inc.
"The Chop House" logo, The Chop House "meat cleaver" icon ( ), and Connor Concepts® are registered trademarks of Connor Concepts, Inc.